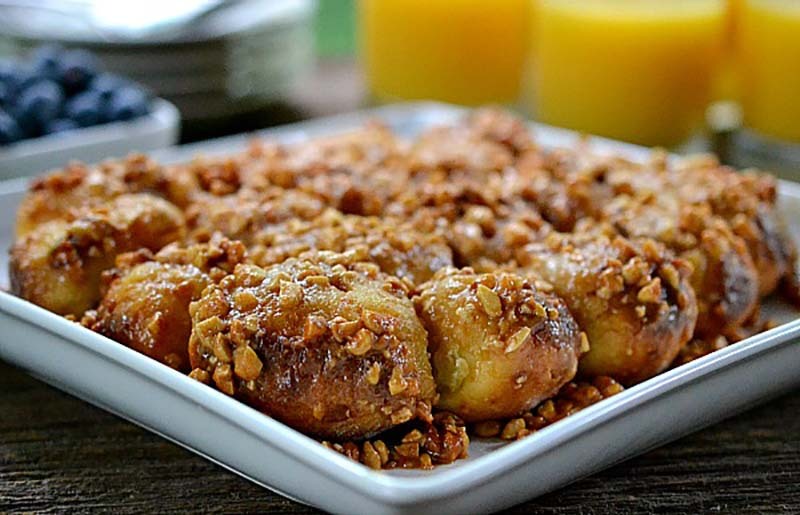 Perfect for the family - gooey peanut butter rolls for breakfast or anytime. In large mixer bowl, combine 1 cup flour, yeast, sugar and salt; mix well. In saucepan, heat milk, water and butter to 120-130°F (butter does not need to melt). Add to flour mixture. Add egg. Blend at low speed until moistened; beat 3 minutes at medium speed. By hand, gradually stir in remaining flour to make a stiff batter. Cover; let rise in warm place until light and doubled, about 45 minutes. Stir down batter. Prepare Topping by combining all ingredients until smooth. Spoon into greased muffin cups, spoon batter over Topping. (*see note below) Cover; let rise in warm place until light, about 30 minutes. Bake at 350°F for 20 to 25 minutes until golden brown. Invert immediately onto cooling rack. Serve warm or cold. Recipe featured at Café Terra Blog. To roll the peanut butter batter rolls into individual balls (pictured): In 9x9 inch baking dish spread out peanut butter mixture evenly on bottom of baking dish, sit aside. After dough has risen and doubled in size, generously flour the surface you will be working on. Roll the dough carefully on the floured surface. The dough is very loose, use a tablespoon and scoop out a ball of dough. With flour on each hand, carefully roll and shape the dough into a ball. Shake off excess flour and place formed ball into baking dish. Try to have each ball about ¼ inch apart. Continue with second rise and baking directions listed above.